Just outside the gates of the Lord Selkirk Provincial Campground in Belfast, P.E.I., lies one of the Island's oldest cemeteries. Until recently, it was easy to drive by only feet from its borders and not know it even existed, though most local people knew of its location. It had become overgrown with woods and underbrush, and a sign and chain fence that were placed there years ago, have long since disappeared. 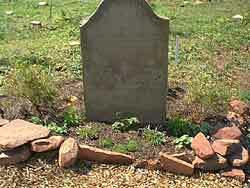 As you have seen, in our original article on the cemetery, a restoration was sadly needed. 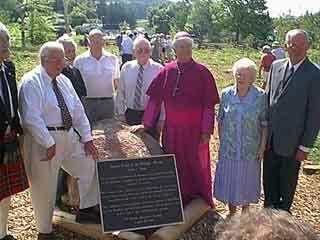 Work has been proceeding all summer under the watchful eye of the Belfast Historical Society, and the cemetery was rededicated in a commemorative ceremony, Saturday, August 22, 2000. Restorations have been done on the two Scottish stones that were still in the cemetery, the Nicholson stone cleared and straightened, and the Martin stone that was in pieces cemented on to a new marble backing, placing the existing pieces in the location on the stone they would have been originally. A number of previously unknown grave locations have been identified and marked. Trees overgrowing the cemetery have been removed, leaving only the odd birch tree to shade the cemetery's visitors. 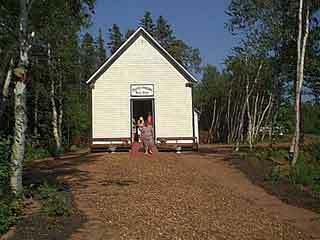 The old Belle River Church has been restored in its new location, and now serves as an interpretive center for the cemetery. His Excellency, Mgr. Vernon Fougere, Bishop of Charlottetown, blessed the cemetery and its inhabitants during the opening cemetery, and the Rev. Ted MacDougall, former pastor of the Belle River Church said further prayers. Francis Blanchard, well known P.E.I. and Acadian historian related the history of the Acadian settlement here, and the hardships the Acadians endured up to and including the death of most in the sinking of the Duke William during the deportation. He continued with the story of the Doiron family, some of the sole Acadian survivors of the sinking, who later returned to P.E.I. to Rustico, and who have fourished there, ever since. 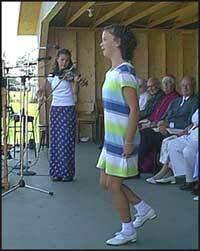 Acadian dancers graced the stage during the opening ceremonies, only part of the Acadian representation in the ceremony, which also included Francis Blanchard, well known Acadian historian, The Rustico Choir, and further entertainment by the Doiron family. Lieut. Governor Gilbert Clements, Ernest McLeod, coordinator of the reconstruction, His Excellency Mgr. 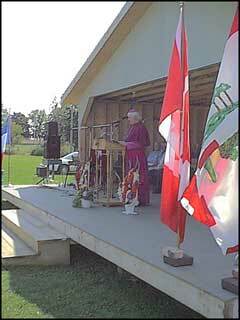 Vernon Fougere, Bishop of Charlottetown, Mrs. Hesta MacDonald, Pres. Belfast Historical Society, and Wilbur MacDonald, MLA for Belfast/Pownal Bay district, and others surround the plaque commemorating the restoration. 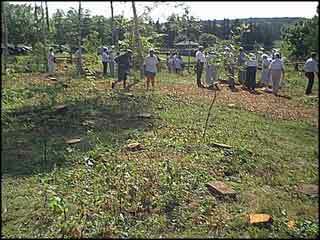 After the opening, groups of people toured the newly cleared cemetery. Note, in the forground, some of the acadian stones, simple blocks of Island sandstone found during the reconstruction. There is still much work to do, and the clearing, landscaping, and futher preservation will continue into next year, but the foundation had been laid for the preservation of this cemetery into the future. We would like to congratulate the Belfast Historical Society on a job well done, perhaps their most ambitious project yet.